REDFOX, Pint-puller turned Barbarian, was one of the brightest (and best-selling) stars in the short-lived HARRIER COMICS firmament (although I much preferred CONQUEROR, the Star Trek wannabe, which I've covered in previous posts), notching-up ten issues from Martin Lock's mid-eighties up-start and a further ten from Valkyrie Press. There were also two Trade Paperback collections from Harrier which I've not seen for many years, suggesting a low print run and some degree of scarcity. 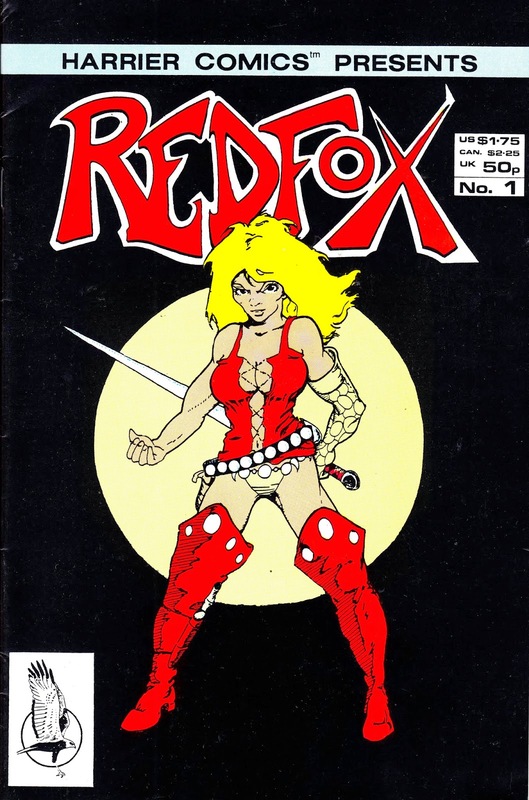 The early issues of the Harrier run repeated the Conqueror trick of reworking material that had already had an outing in fanzines (in this case, the self-published - by creator 'Fox' - Redfox 'zine) before embarking on freshly-minted strips.